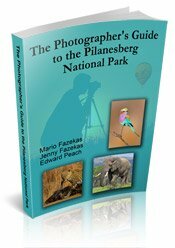 Situated in the central area of the Kruger National Park, Hamiltons Tented Camp gets its name from Colonel James Stephenson Hamilton who was the first warden of the world famous Kruger National Park in the early 1900’s. 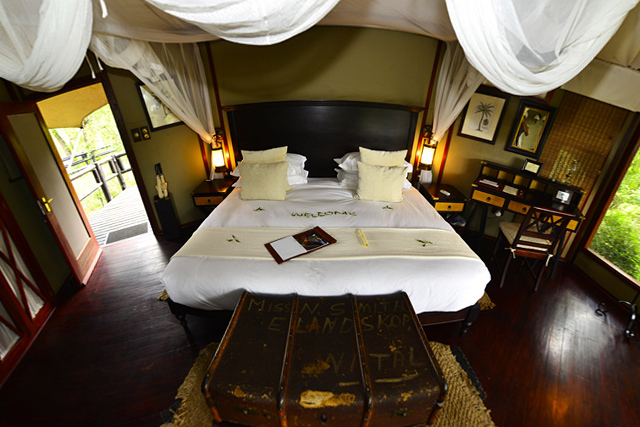 Hamiltons Tented Camp not only offers a great view over the Nwaswitsontso River, but also takes you on a journey into a bygone era of a true “out of Africa” safari adventure. The Hamiltons team warmly welcomed us on arrival by doing a welcome dance, which was great fun. 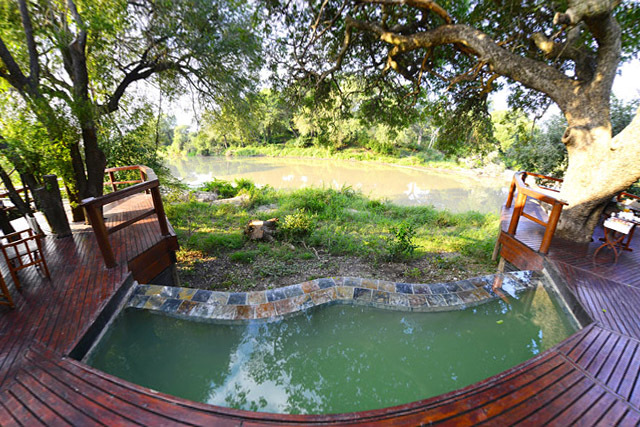 The main area leads out onto a spacious wooden deck that is shaded by large Jackalberry trees and overlooks the riverbed and a water feature. 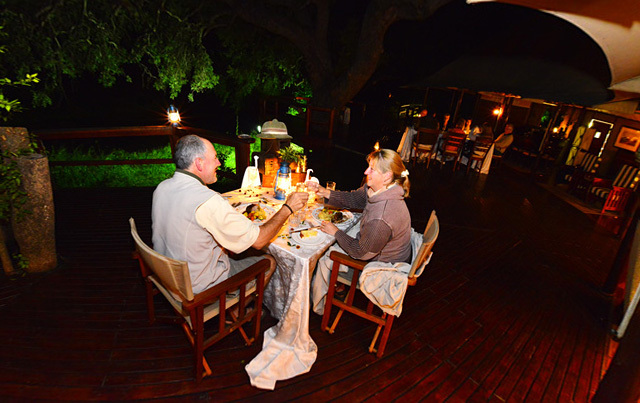 We had lovely meals there; lunch was buffet style with salads, roast chicken and a variety of tarts, then a dinner of Butternut soup, roast rack of lamb finished off by Malva pudding, while enjoying the night view over the river. 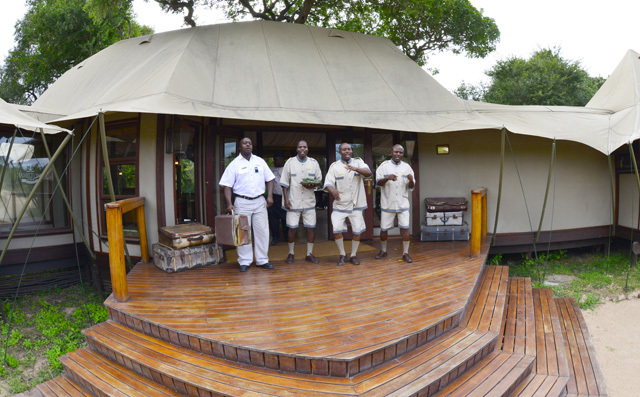 The lodge is not fenced and the animals move freely through camp, but it is safe to walk round during the day. 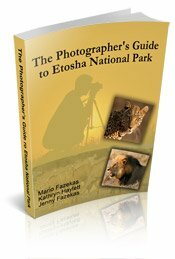 We saw impala and bushbuck in the lodge (leopard's food!). From the main area, high wooden walkways lead you to the swimming pool area and onto four of the tents on the left hand side of the main area. The other two tents are on the right hand side of the communal area. 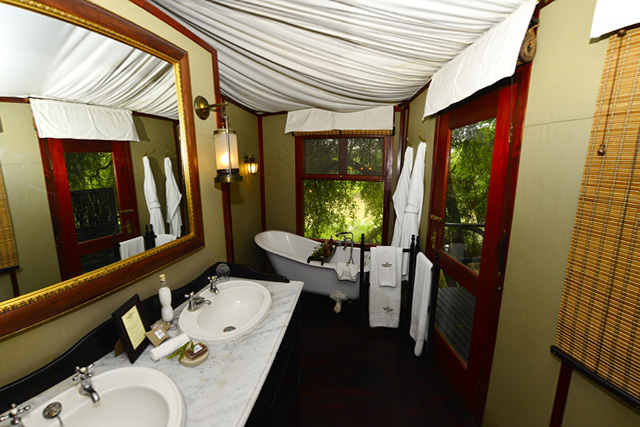 These six Safari tents have a true romantic feel and each suite is furnished with mosquito nets, slipper bath, outdoor shower and a private deck, giving you a superb view of the seasonal river and African bush. 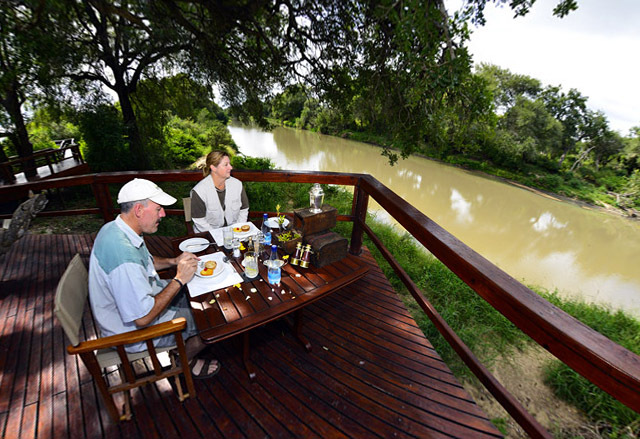 From the privacy of your tent deck, look out for the water birds or that elusive Leopard that may come walking down the riverbed or just enjoy the peace and quiet that the bush has to offer. 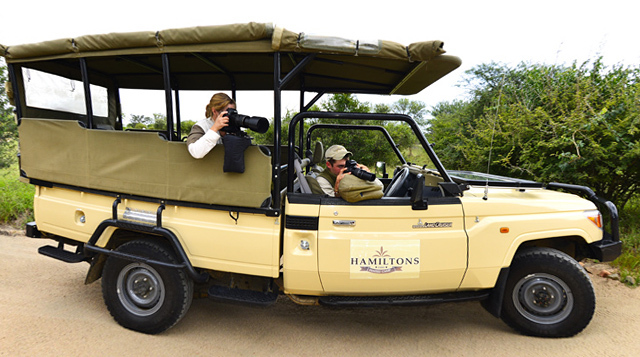 Hamiltons Tented Camp offers both morning and afternoon game drives in open 4 x 4 vehicles or you could do a guided safari walk. We had 3 lovely game drives with our ranger Joe, but sadly did not see much in the ways of animals besides some rhinos and elephants but that is how the bush goes! 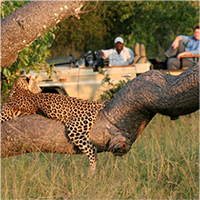 We did however enjoy Joe’s company and his knowledge of the African bush and wildlife. 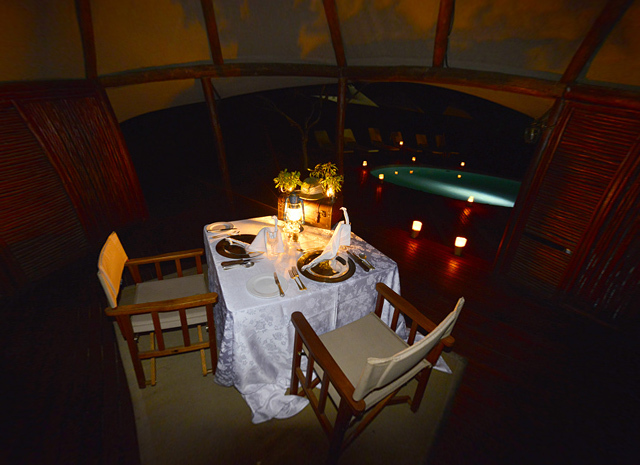 Hamiltons is one of three sister lodges in the Mluwati concession, the other two being Hoyo Hoyo and Imbali. 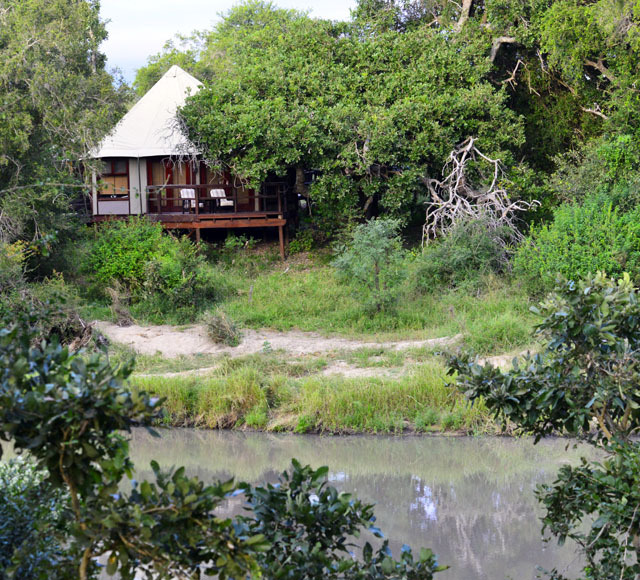 Imbali is the biggest lodge and the staff of all three live here. For three days the manager of Hamiltons, while travelling from his house at Imbali to Hamiltons, saw the resident leopard walking in the road and he would radio us but by the time we got reached the area where the leopard was seen, he was gone! 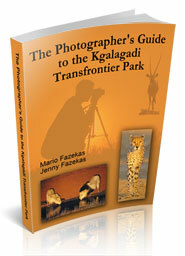 For more information on the lodge or to make your booking, please click here.